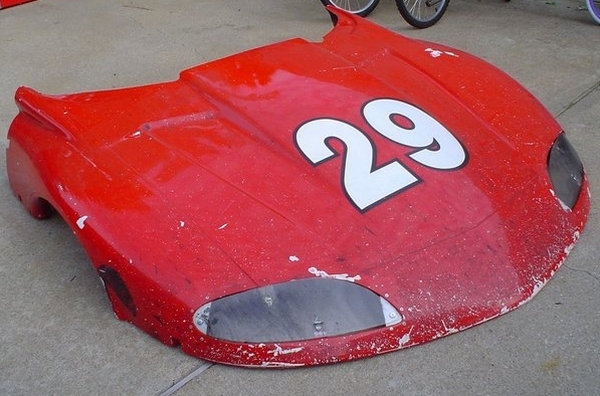 So here it is May of 2008 and I have a spare set of bodywork for Scratcher. Sure, its red (I strongly dislike red as a color for cars…especially my cars) and a little beat up. 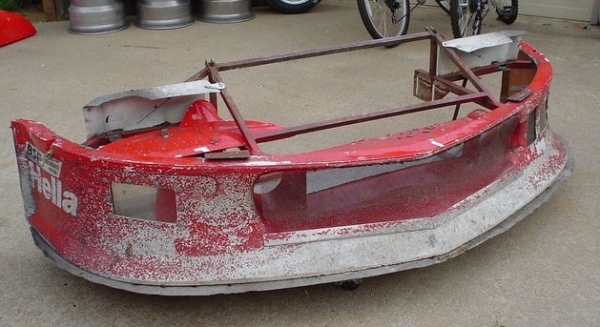 It’ll need some repair and some paint, but the price was right. Free-fiddy! The problem was the shipping. 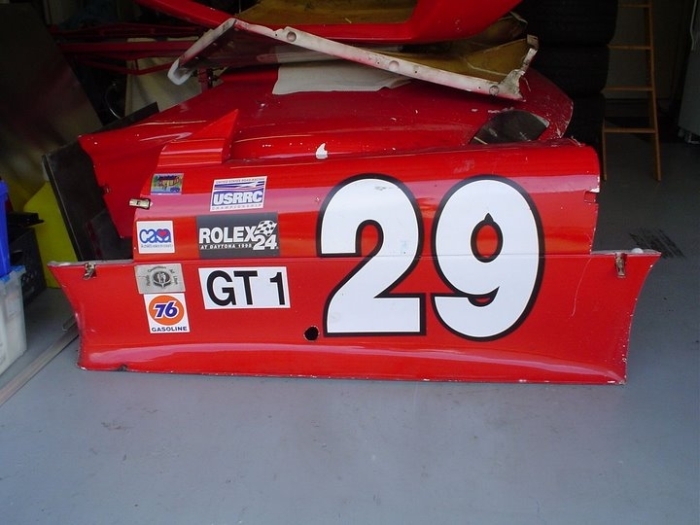 Two years ago (April 2006) I caught an ad in the back of Sportcar from a guy selling a pile of GT1 parts. I called and we chatted. 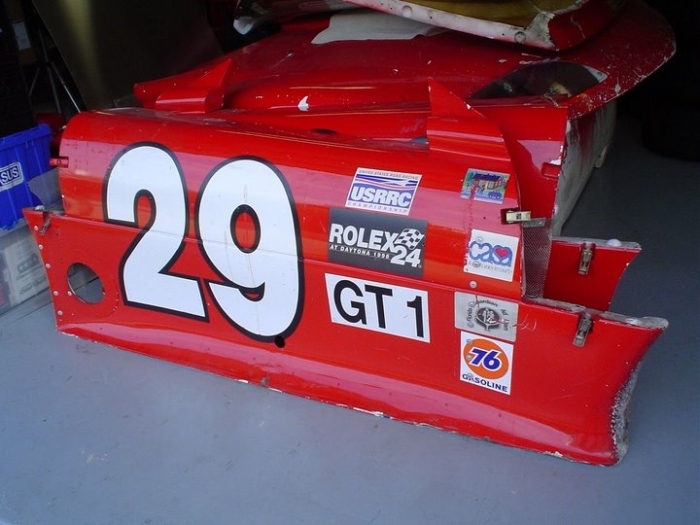 Supernice guy who had the body on a car that ran the Daytona 24 years ago. It was a complete body with an extra lower nose. 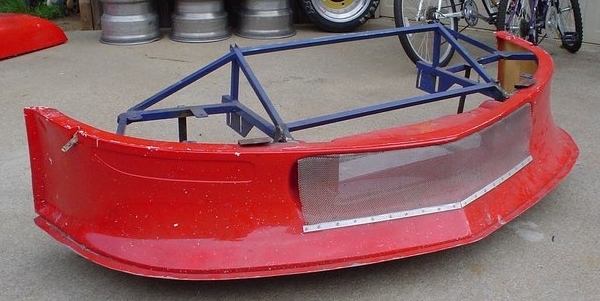 The crown jewel (and reason I called) was the fact that he had the correct rear wing. 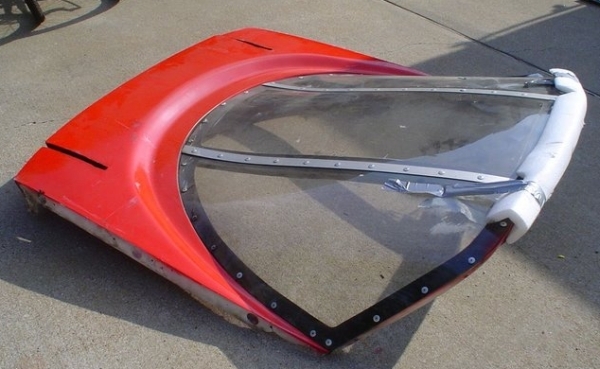 He wanted a decent price for the wing, but if I bought it, he said he'd throw in the complete body. I was sold! The only problem is that he was in Washington state. Argh. He also had lots of other stuff I wanted, but at that point I was still piecing together a motor and the rest of the car so I just bought the wing and body. I FedEx’d him a check and he very carefully packed the aluminum wing and shipped it down to me. We weren’t sure how we were going to get the body down to Texas , but we figured something would come up. For about 9 months he and I worked our friends and contacts to find passage from the pacific northwest to Texas . No dice. On a lark I called a guy who had an MX5 cup team based in Texas . 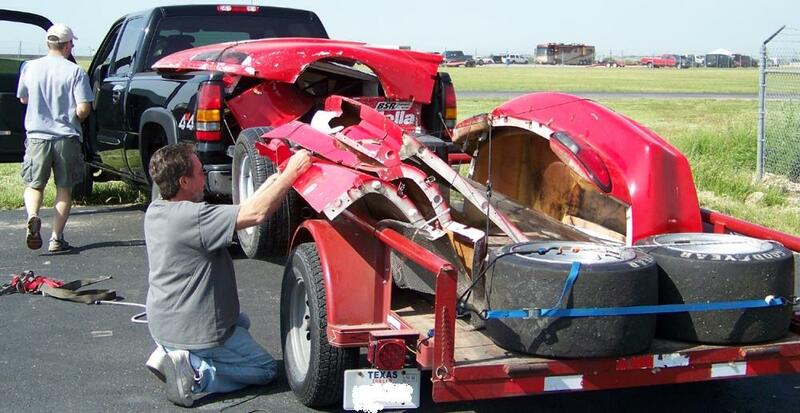 They were going to the Portland race and after a quick discussion he agreed to haul the body assuming that David (the seller) could get the body to Portland . David said he could and a few weeks later my body was on a truck heading south. Unfortunately it didn’t get south enough. The MX5 cup team ended up NOT coming all the way to Texas as they thought they would and the panels went to their new shop. In northern California . ARGH!! Now it was the middle of 2007 and I had thoughts of just driving over and picking them up. I figured that it would take about 48 hours to get there and back. It would be about the same size trip as picking up Scratcher (48 hours straight). Nick and I talked about making the trek in late 2007 or early 2008. We’d leave Friday at noon, be there Saturday at noon and be home Sunday at noon. It all sounds so easy, but having done several trips like that I knew it’d be a pain. Fuel cost alone would exceed 600$. In late 2007 I posted for some help on an automotive board that I’m on. A few folks responded with questions and one guy who lived in south California told me he could get the body to his place pretty easy and he frequently visited Phoenix . This would make things TONS easier. He was already planning a trip up north in early 2008 and the guy holding the body was ready for him. Of course it fell apart with him not even calling the guy with the body and it just made everything worse. The guy with the body assumed it was leaving so he told some other folks he could store another car. We now had two weeks to get the body out of the shop. Argh. My schedule with work was cramped and this was not looking good. One of the Rolex teams was based in the area and a quick frantic call found them taking a transporter across the country the following week. Now all I needed was someone to take the body from the MX5 guy to the Rolex guy. Another post and another guy says he can handle it. And, of course he doesn’t. ARGH. Thankfully, the MX5 guy had a crew moving a car in and they graciously shuttled the body down to the Rolex guy and it was loaded and heading East. Of course, the weekend it would be passing close to Texas ( Oklahoma City is as close to Texas as the transporter was coming) I was going to be in Mexico . Argh. Thankfully Countryman was around that weekend and he graciously ran up to OKC from Ft Worth and met the transporter driver and grabbed the body and kept it for a few weeks. Fast forward to the first weekend in May and Nick and I ran up to MSR-C (borrowing Nick’s dad’s trailer so I didn’t have to haul the big one) before the sun came up one Sunday and met Countryman as he was running with TDE. He had brought the body and we loaded and zipped right back home. We totally looked like the Clampetts moving to Beverly Hills, but the bodywork was FINALLY home!! 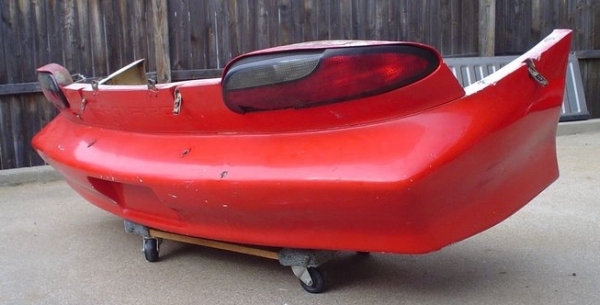 Now I've simply got a red body that needs some fiberglass repair odds and ends and then to be painted whatever scheme I figure out. I'm not sure if I'm going to make it all black to be used as a spare or maybe do the Baldwin 'Hot Wheels' scheme, the old 'Rain-X' scheme or ???. Who knows. 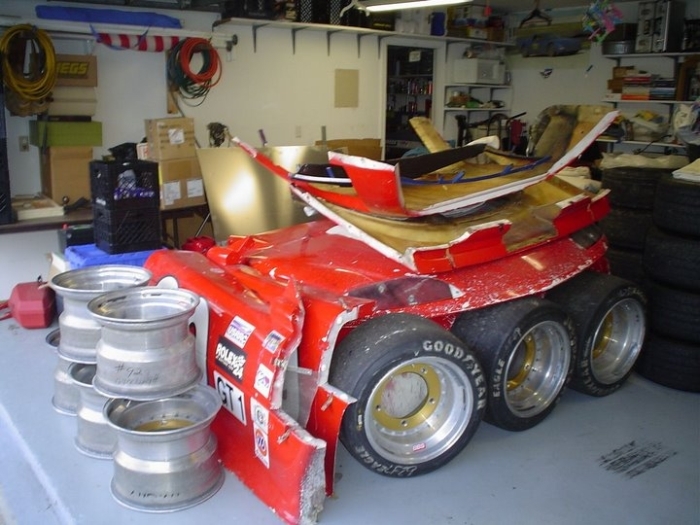 The important thing is that the bodywork is home. Finally.